Last November 23, we were invited to sample Cha Life Milk Tea at Nail It Salon in Rockwell Business Center and I was hooked! 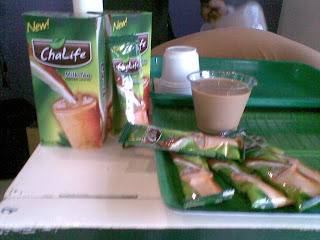 I was quite eager to try Cha Life Milk Tea being a milk tea afficionado. Cha Life Milk Tea is a new powdered milk tea mix concept from Rebisco. It is an instant drink mix that comes in a sachet. All you have to do is add water and you can have an instant hot or cold drink whenever you want to. Each sachet gives a generous serving compared to its imported competitors and a glassful gives an impressive blend of flavors. Cha Life tastes good. It is cool and refreshing but not too sweet. It has that creamy taste that I so love from milk tea plus a hint of its flavorful tea extract. Thanks to Cha Life for a providing us refreshing drinks during our pampering day at tha Nail It Salon.